Gosar was born in Rock Springs, Wyoming, in 1958. He is the oldest of the seven sons and three daughters born to Antone John Gosar and Bernadette M. (née Erramouspe) Gosar. His paternal grandparents were Slovenian and his maternal grandparents were Basque immigrants from Banca, France. Gosar was raised in Pinedale, Wyoming. His parents have been described as devoted Republicans who attended the national conventions for former presidents Richard M. Nixon and Gerald Ford. Gosar's brother Pete Gosar, a former college football player at the University of Wyoming, is a former chairman of the Wyoming Democratic Party and was a candidate for governor of Wyoming in 2010 and 2014. As of 2019 Pete Gosar is the executive director of a free health care clinic in Laramie, Wyoming, where he works with his physician sister, Grace. Gosar received his B.A. from Creighton University in Omaha, Nebraska, and his D.D.S. from the Boyne School of Dentistry at Creighton. He owned his own dentistry practice in Flagstaff, Arizona for 25 years. He was the Arizona Dental Association's "Dentist of the Year" in 2001, and was inducted into the ADA Hall of Fame, also serving as its president. He was also president of the Northern Arizona Dental Society and vice-chair of the ADA council on governmental affairs. In 2009 Gosar, who had never run for elected office before, announced that he would challenge Democratic incumbent Ann Kirkpatrick in the 1st district in the 2010 elections. He was identified as a Tea Party candidate by The New York Times because the Arizona Tea Party featured him on its website. Gosar won the Republican primary. He was endorsed by former Alaska governor Sarah Palin and three Arizona county sheriffs: Maricopa County's Joe Arpaio, Coconino County's Joe Richards, and Pinal County's Paul Babeu. Kirkpatrick challenged him to five debates across the district. Gosar initially agreed to one debate, but later withdrew. He released a statement explaining that his decision to withdraw from the debate was based on the long drive to and from the television station, KAET in Phoenix, which had organized the debate, but a producer at KAET said that Gosar's staff had told the station that the candidate could not participate in the debate because he would be attending a fundraiser instead. Gosar defeated Kirkpatrick in the November 2010 general election, taking 49.7 percent of the vote. 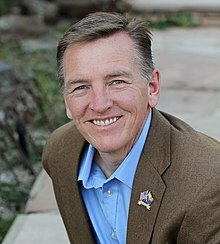 Gosar initially planned to seek reelection in the 1st district, which had been made less favorable to Republicans as a result of redistricting, but with Kirkpatrick priming for a rematch, he changed his mind and announced in January 2012 that he would run in the newly created 4th district. The 4th had absorbed much of the western portion of the old 1st district, and was heavily Republican. As part of the move, Gosar bought a second home in Prescott, which he claimed as his official residence. Gosar initially faced a tough primary fight against Babeu, but Babeu pulled out in May 2012 due to allegations of abuse of power. Gosar defeated former state senator Ron Gould and businessman Rick Murphy in the Republican primary, all but assuring him a second term in Congress. In the November general election, he defeated Democratic challenger Johnnie Robinson with 67 percent of the vote. In September 2018 six of Gosar's nine siblings spoke out against their brother and endorsed his Democratic opponent, David Brill, in a series of television campaign ads that drew national and international coverage. In the first ad, sisters Grace and Jennifer, both identified as health care providers, told viewers that their brother did not care about people in rural Arizona. In another ad, called "A family defends its honor," brother David Gosar, a lawyer, declared, "We've got to stand up for our good name. This is not who we are." Paul Gosar responded to the ads on Twitter, describing his siblings as "disgruntled Hillary supporters" who "put political ideology before family". Gosar defeated Brill in the November 2018 general election with 68.2% of the vote. Gosar describes himself as pro-life. Of abortions, he has said, "These procedures undeniably rob the world of a human life in a most cruel fashion... The right thing to do is to ban these procedures." Gosar cosponsored the No Taxpayer Funding for Abortion Act, a bill that would make permanent restrictions on federal funding of abortions in the US. He also cosponsored the District of Columbia Pain-Capable Unborn Child Protection Act, an act placing restrictions on abortions in the District of Columbia. Gosar was given a 100% rating by the National Right to Life Committee, a pro-life interest group, and a 0% rating by NARAL (National Abortion and Reproductive Rights Action League), a pro-choice interest group. In September 2015 Gosar submitted articles of impeachment against EPA administrator Gina McCarthy, asserting that she had committed "high crimes and misdemeanors" and "lied to the American people in order to force misguided and overreaching regulations, which have no scientific basis, down our throats." An EPA spokeswoman said Gosar's resolution "has zero merit and is nothing more than political theater" while fellow Republican and House majority leader Kevin McCarthy confirmed that "There's no plan to impeach Gina McCarthy." On September 17, 2015, in an op-ed on the conservative website Townhall.com, Gosar announced that he would not attend Pope Francis's planned address to a joint meeting of Congress unless the Pope spoke about issues such as "violent Islam" or Planned Parenthood instead of climate change. He wrote that he would treat the Pope the same way he believes "leftist politicians" should be treated. Gosar accused Francis of having "adopted all of the socialist talking points, wrapped false science and ideology into 'climate justice' and is being presented to guilt people into leftist policies." He called climate science "questionable" and criticized Laudato si', Francis's encyclical on the environment. Gosar did not attend Francis's September 24 address, the only member of Congress not to do so. Shortly after Francis's visit, Gosar used his opposition to Francis's addresses as a fundraising tool. A fundraising email for Gosar used his Townhall.com op-ed's catchphrase, "When the Pope chooses to act and talk like a leftist politician, then he can expect to be treated like one", and positioned Gosar as the victim of "unprecedented attacks" from "the liberals, the left-wing media and the Obama political machine." Gosar is against the legalization of marijuana and has expressed concerns about public safety, children, and the commercial industry. He voted against the Veterans Equal Access Amendment, which allows veterans to access medical marijuana, if legal in their state, per their Veterans Health Administration doctor's recommendation. He has an "F" rating from NORML regarding his voting record on cannabis-related matters. In October 2017 Gosar promoted the conspiracy theory that the Unite the Right rally that occurred earlier that year was a left-wing plot to stoke racial discord and to undermine President Trump. Gosar's statements echoed debunked claims that were promoted by Alex Jones of Infowars. Gosar further claimed the Charlottesville rally might have been funded by George Soros, who he said "turned in his own people to the Nazis" despite being 13 years old in 1944. Seven of Gosar's siblings wrote an open letter to the Kingman (Arizona) Daily Miner newspaper denouncing Gosar's claims about Soros as "despicable slander...without a shred of truth", saying the congressman "owes George Soros a personal apology." In 2015 Gosar scored 3% on the National Environmental Scorecard of the League of Conservation Voters. On January 30, 2017, he introduced House Joint resolution 46, which would repeal the authority of the National Park Service to decline private drilling for oil, gas and minerals in 40 U.S. National Parks if the Park Service determines that the mining operation would threaten the environment. The Washington Post said Gosar was "no friend of environmentalists." In 2010 Gosar signed a pledge sponsored by Americans for Prosperity promising to vote against any global warming legislation that would raise taxes. Gosar voted for the Tax Cuts and Jobs Act of 2017. Gosar has stated that the "Second Amendment is one of the most important rights set forth by the Bill of Rights" and that he will "continue to oppose efforts to restrict, infringe, or remove this constitutionally protected right." He was endorsed by the NRA (National Rifle Association) and given a rating of 92%. He was also endorsed by Gun Owners of America and given a rating of 75%. The Arizona Republic described Gosar as "one of the staunchest opponents in Congress to legalizing undocumented dreamers". Gosar stated, "I strongly believe we need to immediately secure our border and oppose amnesty for anyone who blatantly violates our law." He has cosponsored legislation to repeal the 14th Amendment, thus eliminating birthright citizenship for children born in the US to undocumented immigrants. In a May 2018 interview he accused immigration attorneys providing legal advice to undocumented immigrants of committing a crime: "What we need to do is also hold those that are actually helping — what they're saying is help, but assisting in a crime — to be prosecuted as well." He was given an "A" rating by NumbersUSA, an organization in support of immigration reduction. In December 2014 Gosar drew controversy when he referred to American Indians as "wards of the federal government". He was responding to concerns from members of the Fort Apache Indian Reservation in eastern Arizona when he made the comment at the round-table talk in Flagstaff. The discussion had addressed the proposal to swap 2,400 acres of southeastern Arizona's Tonto National Forest for about 5,300 acres of environmentally sensitive land. The proposal, which was attached as a rider to the 2015 National Defense Authorization Act, would give land sacred to the Apache in Arizona to Resolution Copper Mine, a joint venture owned by Rio Tinto and BHP Billiton. Troy Eid, a Republican and former U.S. Attorney in Colorado, responded to Gosar's comments, "In the heated context of what this represents, it's especially inappropriate to be resorting to what amounts to race baiting." A Gosar spokesperson said his comments were misconstrued. In February 2018 Gosar posted on his Facebook page that the so-called Nunes memo showed "clear and convincing evidence" that certain members of the FBI and Justice Department committed treason. He also specifically said conduct by James Comey, Andrew McCabe, Sally Yates and Rod Rosenstein was "not just criminal but constitutes treason." In what Gosar referred to as "My full statement on the declassified memo", he said he would be "leading [sic] a letter to the Attorney General seeking criminal prosecution against these traitors to our nation." In July 2018 Gosar spoke at a rally in London in support of former English Defence League leader Tommy Robinson. He also used his speech to attack "disgusting and depraved" Muslim immigrants. Gosar and five other congressmen invited Robinson to speak to United States Congress on November 14, 2018, on a trip sponsored by the Islamophobic Middle East Forum. He was expected to get a visa despite his criminal convictions and use of fraudulent passports to enter and depart the U.S.
^ "Elections 2012 – AP Election Guide : Paul Anthony Gosar". NPR. Retrieved December 18, 2012. ^ a b c d Jaffe, Greg (January 12, 2019). "A congressman rails against undocumented immigrants as his estranged siblings care for them and other patients in need". The Washington Post. Retrieved January 13, 2019. ^ "Arizona Congressman 6 Siblings Endorse Opponent ... 'You Can't Pick Your Family'". September 22, 2018. ^ "Paul Anthony Gosar, D.D.S." Rootsweb.ancestry.com. Retrieved December 18, 2012. ^ "Mead wins GOP primary for Wyoming governor". Wyoming Tribune-Eagle. August 19, 2014. Retrieved August 20, 2014. .
^ "Arizona's Former Dentist of The Year Launches Robust Bid to Unseat Ann Kirkpatrick in Congressional District One". Gosar for Congress. October 14, 2009. Retrieved April 18, 2011. ^ "Paul Gosar Finds Easy Victory in CD1 Primary". Prescott eNews. August 26, 2010. Retrieved October 19, 2010. ^ "Arizona Capitol Times Blog Archive » Kirkpatrick wants 5 debates with GOP challenger". Azcapitoltimes.com. Retrieved October 19, 2010. ^ "Gosar pulls plug on televised debate". Arizona Daily Sun. October 19, 2010. Retrieved October 20, 2010. ^ "Gosar backs out of today's TV debate in favor of fundraiser". Prescott Daily Courier. October 20, 2010. Retrieved October 21, 2010. ^ Wilson, Reid (January 7, 2012). "Gosar Will Switch Districts". National Journal. Retrieved December 18, 2012. ^ Sheriff Babeu Abandons Race for Arizona Congressional Seat. Fox News Latino. 2012-05-11. Retrieved 2012-05-11. ^ "Election 2012". Azcentral.com. Retrieved December 18, 2012. ^ CNN, Eric Bradner,. "Rep. Paul Gosar's siblings in new ad: Don't vote for our brother". CNN. Retrieved September 22, 2018. ^ a b c "Siblings savage congressman in attack ad". BBC News. September 23, 2018. Retrieved September 23, 2018. ^ "Dr. Gosar Condemns Abortion Genocide: Disgusted at Congress' Failure to Protect the Unborn and Ban Pain Capable Abortions". Gosar.house.gov. July 31, 2012. Retrieved December 18, 2012. ^ "Bill Summary & Status – 112th Congress (2011 – 2012) – H.R.3 – All Information – THOMAS (Library of Congress)". Thomas.loc.gov. Retrieved December 18, 2012. ^ "Bill Summary & Status – 112th Congress (2011 – 2012) – H.R.3803 – All Information – THOMAS (Library of Congress)". Thomas.loc.gov. Retrieved December 18, 2012. ^ "Paul Gosar – Ratings and Endorsements". Project Vote Smart. Retrieved December 18, 2012. ^ "GOP lawmaker moves to impeach EPA chief McCarthy", Fox News, September 15, 2015, Retrieved September 22, 2015. ^ a b Paul Gosar, Paul Gosar. "Why I Am Boycotting Pope Francis's Address to Congress". Town Hall (republished on Time.com). Retrieved September 18, 2015. ^ Viebeck, Elise (September 21, 2015). "Who is Paul Gosar, the congressman boycotting Pope Francis?". The Washington Post. Retrieved September 22, 2015. ^ a b Flores, Jessica (September 30, 2015). "Gosar goes after Pope; uses boycott to raise campaign money". fox10phoenix.com. KSAZ-TV. Retrieved July 10, 2016. ^ a b c Weigel, Dave (September 30, 2015). "Arizona congressman raises funds off his boycott of Pope Francis". The Washington Post. Retrieved July 10, 2016. ^ "Arizona Scorecard - NORML.org - Working to Reform Marijuana Laws". norml.org. Retrieved December 21, 2017. ^ a b Hawkins, Derek (October 6, 2017). "Arizona congressman repeats claim that Charlottesville violence was left-wing plot". The Washington Post. ISSN 0190-8286. Retrieved October 7, 2017. ^ "Congressman suggests Charlottesville was George Soros–backed conspiracy". VICE News. Retrieved June 7, 2018. ^ Fears, Darryl (February 1, 2017). "This lawmaker wants to ease rules on drilling in national parks, and conservationists aren't happy". The Washington Post. Retrieved February 2, 2017. ^ "Representative Paul Gosar (R)". National Environmental Scorecard. League of Conservation Voters. Retrieved February 2, 2017. ^ "H.J.Res.46 - Providing for congressional disapproval under chapter 8 of title 5, United States Code, of the final rule of the National Park Service relating to "General Provisions and Non-Federal Oil and Gas Rights"". Library of Congress. Retrieved February 2, 2017. ^ "Rep. Paul Gosar misstates crime statistics about 'Daca-aged' immigrants". AZ Central. Retrieved January 31, 2018. ^ "H.R.140: Birthright Citizenship Act of 2011 – U.S. Congress". OpenCongress. Retrieved December 18, 2012. ^ "Trump's elimination of DACA creates a crisis for 'dreamers.' Is it a crisis for Congress?". azcentral. Retrieved January 31, 2018. ^ "Arizona congressman warns attorneys helping refugees". Retrieved May 10, 2018. ^ "2012 Arizona 04th Congressional District | NumbersUSA – For Lower Immigration Levels". NumbersUSA. Retrieved December 18, 2012. ^ Fonseca, Felicia (December 10, 2014). "Rep. Paul Gosar Calls Native Americans 'Wards Of The Federal Government'". Huffington Post. Retrieved January 25, 2015. ^ "Nunes memo proves FBI committed "treason," GOP lawmaker says". Newsweek. February 2, 2018. Retrieved February 4, 2018. ^ Delk, Josh (February 2, 2018). "GOP lawmaker on memo: FBI conduct 'constitutes treason'". TheHill. Retrieved February 4, 2018. ^ FOX. "Rep. Paul Gosar criticized for support of far-right British activist". Retrieved September 23, 2018. ^ "Gosar, Caucus lauds proposal to rescind BLM fracking rule". Kingman Daily Miner. August 3, 2017. Retrieved November 3, 2017. ^ Valley, Jackie (September 28, 2017). "Trump's comments cast uncertain shadow over federal funding for Interstate 11". The Nevada Independent. Retrieved November 3, 2017. ^ Edwards, James (September 26, 2017). "Inventions Caucus Educates Congress on Patents, Commercialization Basics". Inventors Digest. Retrieved November 3, 2017. ^ DeSilver, Drew (October 20, 2015). "What is the House Freedom Caucus, and who's in it?". Pew Research Center. Retrieved November 3, 2017. Wikimedia Commons has media related to Paul Gosar.